Some experiences seem to have happened in someone else’s life. 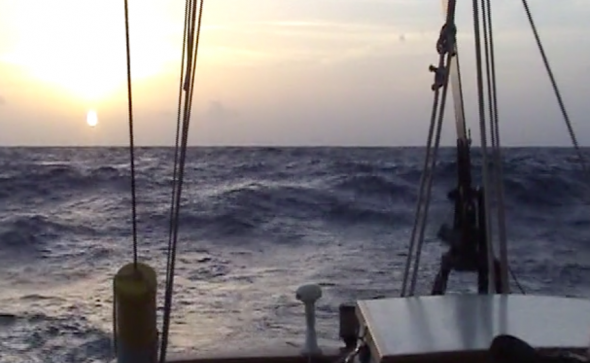 Sailing across the Caribbean Sea was monotonous and I tried to put that to video with long slices of rolling waves across thirteen or so days. That we were passing by the grace of the planet was obvious as both the propellor shaft followed by the generator broke (preceded by the Spinaker and VHF antenna). I wasn’t really happy about that at the time and I gained a much better understanding of the word “mutiny” as my faith in the leadership (there were three of us) was sorely tested. In any case, I probably thought someday I would be sitting at some desk, like now, needing a reminder that there are other places. This entry was posted by John Pasmore on Wednesday, December 14th, 2011 at 8:39 am	and is filed under Outdoor and tagged with Caribbean Sea. You can follow any responses to this entry through the RSS 2.0 feed.